This is a lovely sociable meal where everyone gets to stuff and roll their own tortilla wraps! Slice the chicken breasts into strips and place in a bowl. 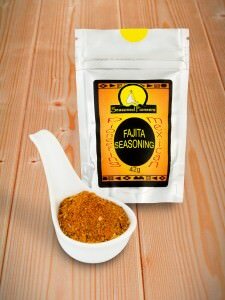 Add the Fajita spice blend and mix well. Leave to marinate for at least 5 minutes. Meanwhile, finely slice the onions and peppers. Heat a frying pan or skillet and add some oil. Once hot, add the onions and marinated chicken strips and cook, stirring frequently to ensure the chicken is cooked through. Before the chicken starts to brown, add the sliced peppers to the pan and cook the entire mixture until the chicken is nicely browned, the onions are soft and the peppers are cooked but still retaining their bright colour. 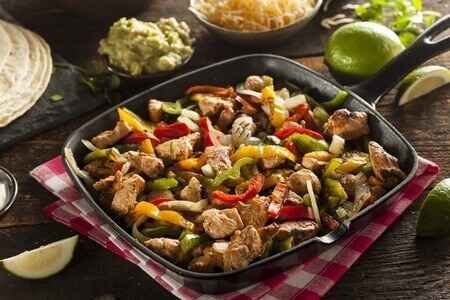 Serve in the pan or a heated dish accompanied by warmed tortilla wraps, salsa, guacamole, soured cream or natural yogurt and grated cheese.